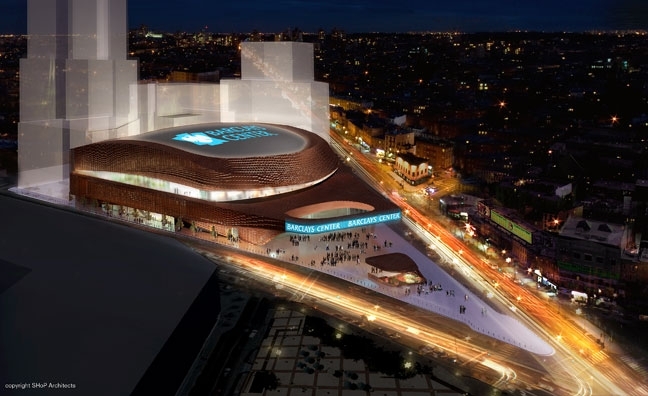 Barclays Center: Future worship center? Yesterday, I shared one my dreams for my Church…to have a facility as grand as the Barclays Center for the worship and service of God in Brooklyn NY. I’ve always had a passion for doing things on a GRAND scale for God and have always been disappointed in how the world will go ALL out for concerts and events while the Church world will show fourth a mediocre display in the name of “humility.” These sentiments I did not share alone but with another man who I’m pretty sure out-passions’ me for God…King David. In the scripture shared above, David saw something about the house of God…that it should be great, magnificent, famous and massive in the sight of all the nations! Can people say that about my house? Not yet, but that’s where my heart is…building an audacious house that the world will take notice of, come to and be transformed by the grace & glory of our God! You see, when David made the decree to build the temple for God, God didn’t have a specific building to be worshipped in. Under the old covenant, God dwelt in a box called the Ark of the Covenant. Under David and Solomon’s reign, they shifted God from a tent to a massive temple. However, under the new covenant, God expressed HIS truest desire in Jesus Christ…not to dwell in a building built by hands but in a Body…People will be the building He dwells in! So, taking David’s revealed interest in building a grand house for God and applying it to the new covenant, we can discover that God wants His community of believers to be a PEOPLE that are magnificent, famous, world-renown and splendid. My passion is not to build so much a big building as much as it is a PEOPLE that when gathering, it will take a building as large as the Barclays Center to hold us! The Church has a significant calling to impact and influence the nations. David believed the house of God should be great in the sight of all nations. Jesus said to the Church go and make disciples of all nations. David made extensive preparations for his son Solomon to carry out this task. Jesus made the ultimate preparation through His sacrifice for His task to be carried out. David left billions of dollars worth of gold, silver, lumber etc. (1 Chronicles 22:14-16) Jesus left us the unlimited supply of His Spirit to get the job done. God was with Solomon in order to build the house. God is with us to build a people. In today’s dispensation of grace, God is blessing the building up of people. God is with us when we know what he’s blessing and dedicate our lives to what He is doing. My heart is set on building as many people as possible for Jesus. I see us outgrowing building after building until the only size building that can hold us is an arena such as the Barclays Center. Wishful thinking? Maybe…but scriptures declare that which was built for the wicked is actually being built and laid up for the just. At Hungry 4 God Church we are dedicated & committed in the building up of God’s House. 1.) Remember to Pray (My house shall be called a house of prayer) We will stay together and grow together through prayer. 3.) Remember to Preach /promote the gospel (Matthew 24:14) Promote by inviting, we don’t have much time left. Promote, promote promote! 4.) Remember the people (to gather & build) Church is not only about what we can get but also what we can give. We must get connected to build people. What else do you believe are important elements in seeing a Church fulfill the great commission?